Students can separate the pigments present in leaves. This practical sees pupils using chromatography to see what pigments are present in leaves. 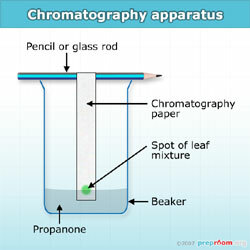 Firstly a strip of chromatography paper is cut and suspended from a pencil or glass rod inside a beaker. The bottom of the paper needs to be just resting on the bottom of the beaker. The leaves need cutting up using the scissors and placed in a mortar along with a pinch of sand (used to break down the plant cell walls) and a few drops of propanone. This mixture should be ground for several minutes. When the leaves are thoroughly mixed, A very small drop of the liquid can be taken and placed on the chromatography paper, a couple of centimetres from the bottom. Some propanone can be added so the level is just below the spot of leaf liquid. 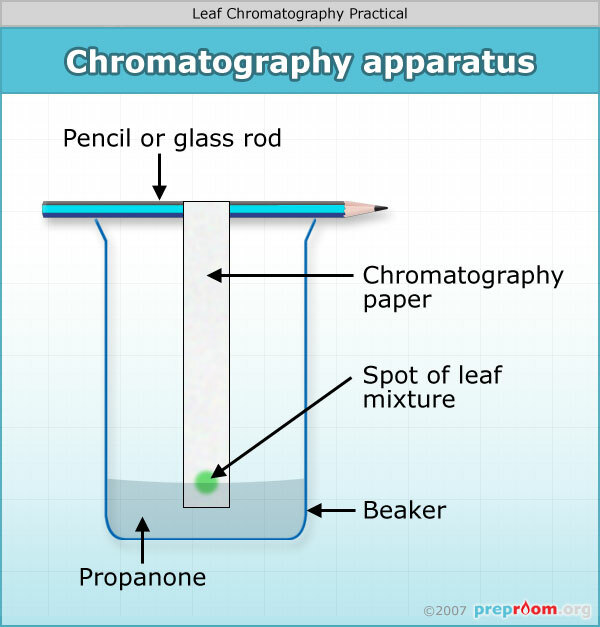 The apparatus can be left set up until the paper has soaked up as much propanone as high as possible. If the colours are not as vibrant as they could be, a more concentrated solution may need to be applied to the paper. This can be achieved by dropping some of the leaf liquid onto the paper, allowing to dry and repeating the process several times, building up a concentrated layer.